I love discovering new recipes online. I hardly use cookbooks (but I pin plenty of recipes on Pinterest). I'm always trying new recipes and I've decided to try to post more of our family's favorites on my blog this year! 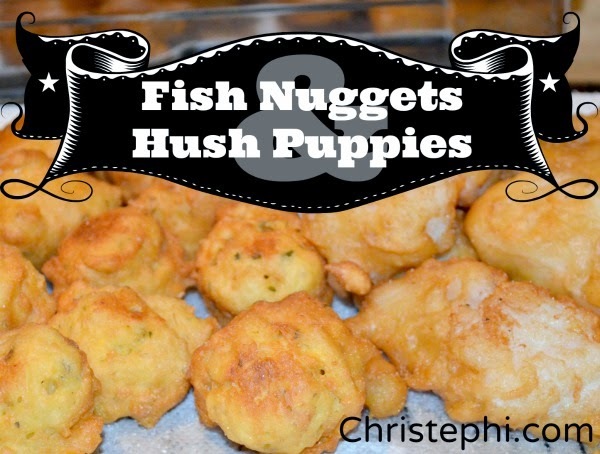 Tonight I made delicious fish nuggets and hush puppies! Hubby said they taste exactly like Long John Silver's. I'd like to think they taste even better. They were a big hit!! I made both nuggets and hush puppies at the same time, frying them together in batches in the oil. Cut fish into 2-inch pieces. Combine the dry ingredients in a bowl and mix thoroughly. Add water and stir until just combined. Heat oil to between 360 and 375 degrees Fahrenheit. Coat each piece of fish in the batter and fry until golden brown, about 3-4 minutes per side. Combine the minced onion, flour, cornmeal, baking powder, salt, sugar, onion powder, and parsley in a bowl. Whisk the egg and milk in another bowl. Whisk the egg mixture into the flour mixture until just combined. Heat oil to between 360 and 375 degrees Fahrenheit. Carefully drop tablespoonfuls of batter into the hot oil. Fry about 4 minutes per side. Transfer to a paper towel-lined baking sheet using tongs or a slotted spoon. Sprinkle lightly with salt.